My tradition has always been to make a dozen types of Christmas cookies, and merrily eat them by fistfuls throughout the whole month of December. So this year, I have been nervous. I have been wondering whether I will delight in the Christmas season without eating ALL THE COOKIES. Will it feel like a gift to know that I’m free from the guilt and stomachache I used to experience when I over-indulged? Or will it feel like a punishment to watch others enjoy the spoils of the season when I’m not joining in? Maybe you don’t at all have worried thoughts about how much you might eat this season. Maybe you know that in January, you will shape up, and you won’t be damaged and craving on the other side. But if you are like me, you might be trying to feel your way through a new pattern. For me, part of giving up sugary desserts has been finding something healthier to replace them. I believe that we should try to put good things into our bodies, but we shouldn’t surrender enjoyment! God gave us taste buds and preferences for a reason, and this girl likes chocolate. So this Christmas, when I want to enjoy some Christmas cheer with my friends or my family, I will be nibbling on a chocolate gingerbread date ball. 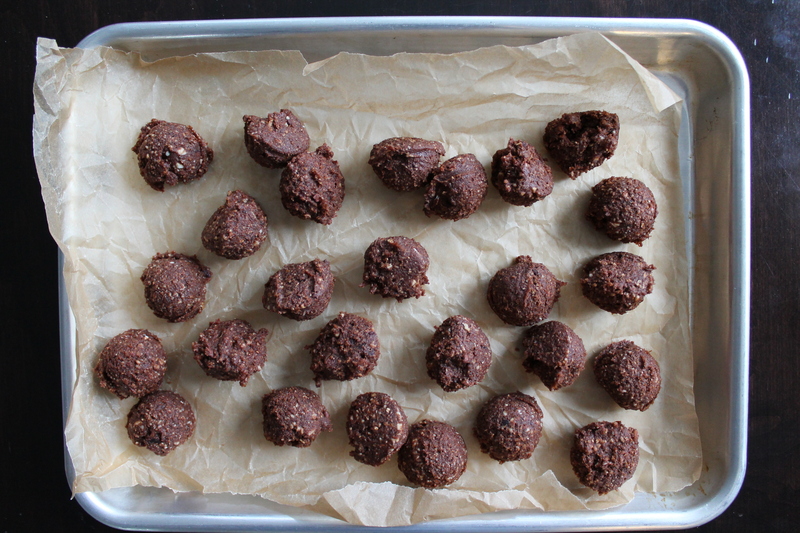 These date balls are full of fiber, protein, healthy fats, and anti-inflammatories. They are chocolatey and spicy and they remind me of one of my favorite winter cookie recipes (Double Ginger Chocolate Chip Molasses Cookies, in case you were wondering). Dessert alone won’t make Christmas merry and bright, but it sure is tasty! Date balls are so easy to make. You basically just plunk all of the ingredients in a food processor and let the processor do all the work! 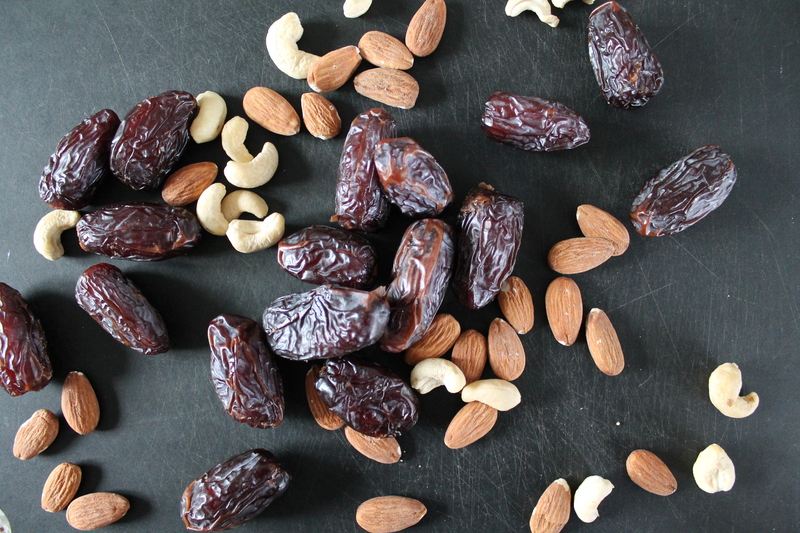 Start with dates and nuts. Always use Medjool dates: they are soft and a little caramelly, and they make gooey and decadent date balls. I used raw almonds and cashews for this recipe, as my sweet daughter is definitely not allergic to those nuts, and they both have a mild flavor that won’t compete with the ginger. Blitz until the dates and nuts break down into small, sticky, gravelly bits. Add cacao (or cocoa) powder, oats, a bunch of warm spices, salt, some freshly grated ginger, vanilla, and a drizzle of molasses. Process again. 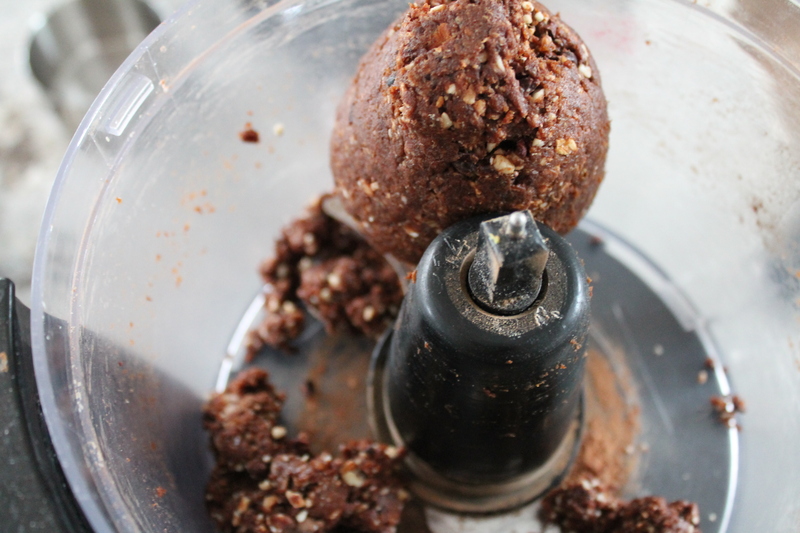 Toss in cacao nibs, if you have them, and then process until the mixture comes together in a thick, sticky ball. Scoop by teaspoons onto a sheet of parchment. Roll into balls. If they are super sticky (as mine were), you can flash freeze them for 20 minutes and then do the rolling afterward! And now comes the final, very important step: roll them in cinnamon and cacao/cocoa powder. 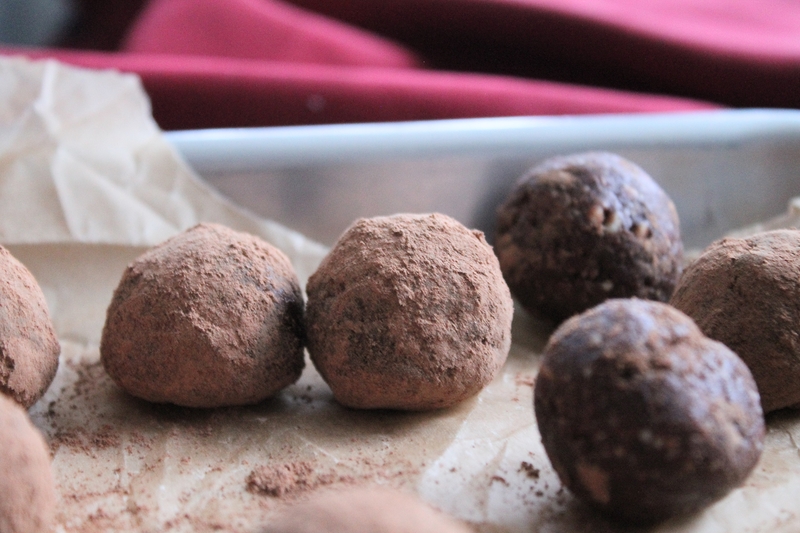 This is so important, because the cinnamon balances out the strong ginger inside the truffles. It adds a hit of spice that I find very delightful, and is reminiscent of gingersnaps, which are typically rolled in cinnamon-sugar before baking. Yum. 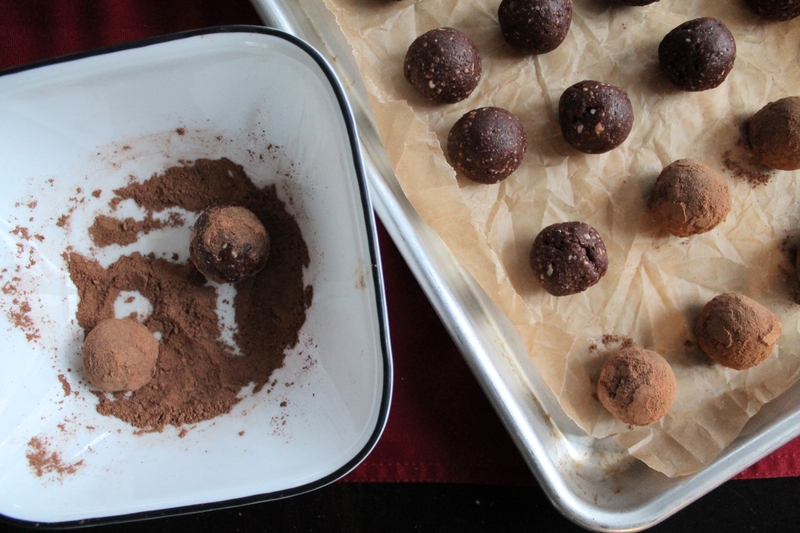 Okay, you can skip this step if you are not into making your date balls look like truffles. Just like you could substitute ¼ tsp. 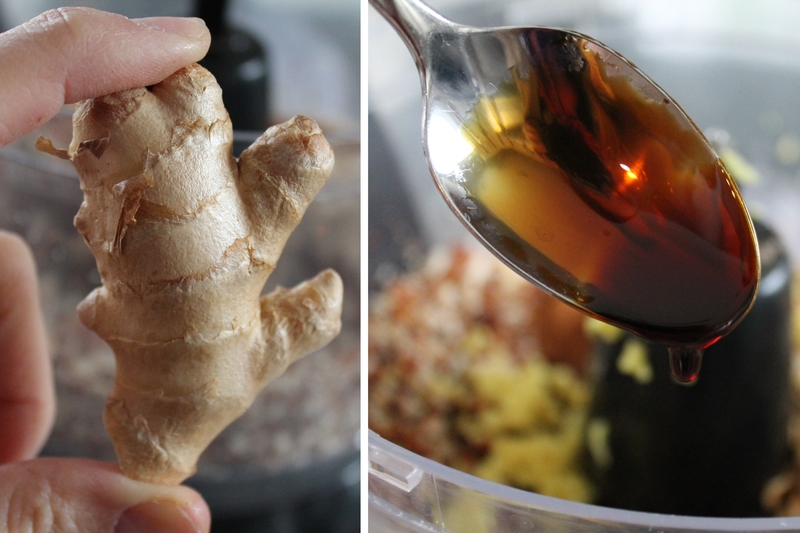 ground ginger for all that fresh grated goodness inside the truffles. But I say go for broke. It’s Christmas, after all! I hope you enjoy your Christmas season, whether or not you are able to indulge in all the great sweet treats that are shared with you! 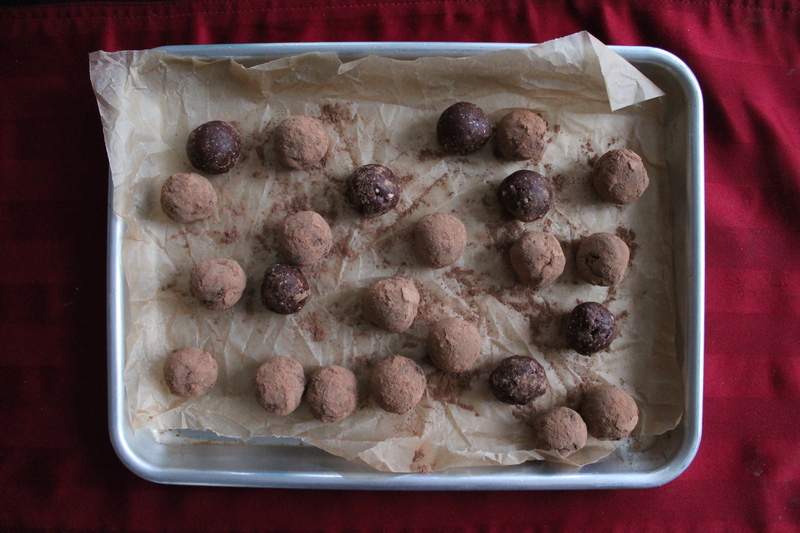 I hope you can bring some joy to your family and friends, and maybe a batch of chocolate gingerbread balls, too! Merry Christmas to you! ½ tsp. cinnamon, plus 1 tbsp. 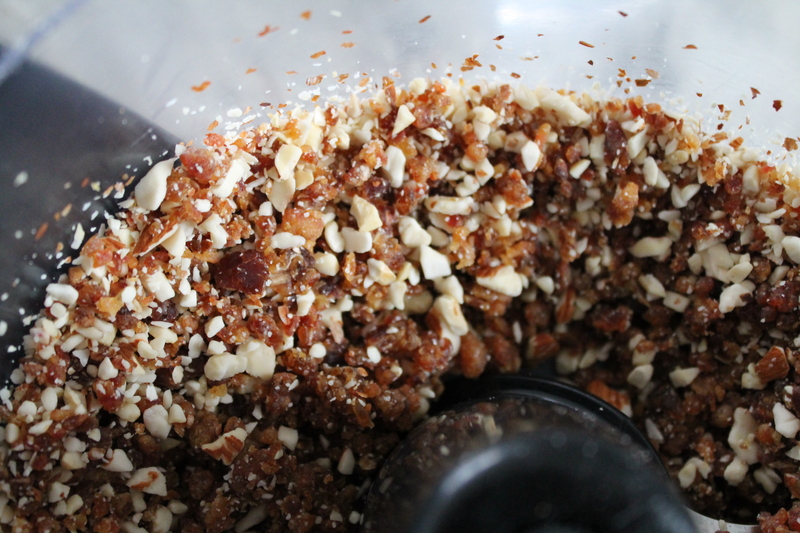 Combine the dates and nuts in a food processor and process until they break down into small, pebbly bits. Add all of the remaining ingredients except for 1 tbsp. cacao powder and 1 tbsp. cinnamon. Process until the mixture comes together in a sticky ball. Scoop by teaspoons onto a cookie sheet. Roll gently into balls. Combine the remaining 1 tbsp. cacao powder and 1 tbsp. cinnamon in a bowl. Roll the date balls in the cinnamon mixture to coat. *If the dates are not very soft, soak in warm water for 10 minutes, then drain, before adding to the food processor. Few questions, is cacao powder the same as coco powder? Cacao powder is very similar to cocoa powder, but it’s raw. They have very slighly different flavors, but you can use them interchangeably! The texture is chewy, like caramel, perhaps…dates are obviously sweet, but they taste like dates, not like sugar! I like them because they are not a chemical sweetener or a plant extract, but just a naturally sweet fruit. I think as long as you aren’t expecting a Lindor truffle, you could really enjoy these!